Idris Elba, the living embodiment of “suave,” was labeled “too street” to play James Bond by Bond author Andrew Horowitz. I just had an interesting conversation with someone whose white teens are using the slang words “finna,” “aight,” “brah,” etc. She characterized it as “shortening words to sound hip.” I’m almost certain she just didn’t know where the terms came from; I don’t think she was trying to be erasive. But it brought to mind how poorly we’re handling political issues around language, especially in the theatre. Those slang words aren’t about being hip and cool– they’re about being Black. I’m not trying to stop Black people from influencing the language as a whole. Black slang is, and has always historically been, one of the most important influences on the way English is spoken in America. But understand the context here. When a Black person uses the slang they create, they’re slammed for not being “professional,” not being “articulate,” but when that slang finally makes it to white mouths, it becomes “hip” and “cool.” Usage changes language, and language is political. Our culture constantly appropriates Black invention as “hip” and “cool” while deriding and marginalizing Black people for using their own inventions. Language is an enormous part of that. If it’s become “hip” for white kids to say “finna,” how are we approaching Black people who use their own slang? Because right now, I see a hallway full of shut doors for Black people who aren’t speaking perfect English at all times. I corrected a girl for saying “ax” in my class last year, and I’m deeply ashamed of that now. I read up on that usage, and I came to understand how wrong I was. Language is political. We have to understand what we’re enforcing, and why we’re enforcing it, when we police usage. 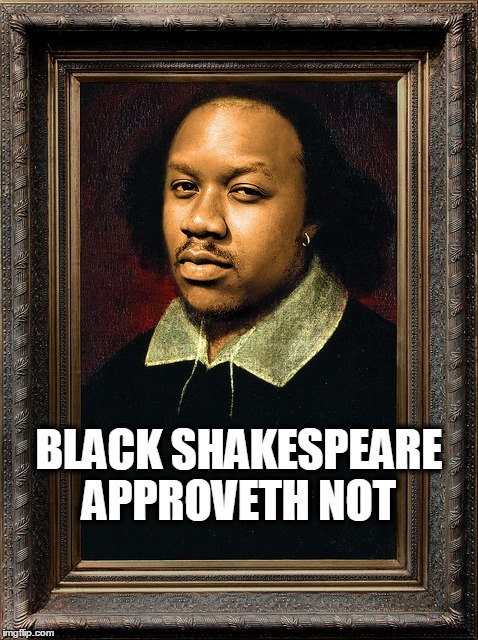 I know a Black actor who was told by a Black professor at the university where I used to teach that he would never be cast in Shakespeare because his speech was “too Black,” and that he needed to amend his speech in order to be cast. The actor told me this after I had cast him in several Shakespeare plays at my company (as well as several new plays– this actor is phenomenal). As a white director whose approach to classic work deliberately eschews stiffness and formality, I’ve always had an eyeroll for “American Standard,” which we still teach actors to this day. Even actors completely untrained in it will often fall into its faux-British, formal tones when doing Shakespeare. A couple of years ago at my company’s general auditions, I had a very diverse bunch of college actors, all from the same university (perhaps not coincidentally, where I used to teach), and every single one came in with a cookie cutter, faux-British, semi-Standard American accent. I actually considered contacting the chair with a “What are you teaching these kids?” email, but I knew exactly what they were doing: prepping them to perform in a world that rejects anything that doesn’t reek of privilege. When we cast Shakespeare, when we cast new plays, when we teach actors, when we go to the theatre, when we choose our seasons, what choices are we making that reinforce privilege? How often have Black actors heard they were “too urban” or “not urban enough” for a certain role? How often have Asian and Latino actors been asked to “do the accent”? How often are we shutting people out because their speech– or their writing– does not conform to the expectations of white privilege? What does it mean to ask an actor to perform Blackness in a way white people expect or want? How often are we encoding the enforcement of privilege in our casting? How often are we encoding the enforcement of privilege when we say we’re teaching actors “speech and diction”? How much policing of speech is enforcing privilege? American culture– and that includes American theatre– needs to take a long, hard look at the multitude of ways we police speech, especially the speech of people of color and people without class privilege. I’m including both spoken speech and written speech in that. If we’re making commitments to diversity, then we need to think about the multitude of ways in which we’re reinforcing the idea that diversity must be performed only in ways that are acceptable to white privilege. White people are measuring the acceptability of people of color by how closely they resemble whiteness off stage, and how accurately they can portray Blackness to white specifications in various situations on stage. I’m not claiming this is limited to Black people– cis people measure the acceptability of trans people by how closely they resemble cis people, and so on. But the topic at hand is how we believe Black speech is acceptable coming out of white mouths, but reject it coming out of Black mouths unless we can directly profit from it. In other words, if white America is talking about how hip and cool it is that white kids today are saying “finna,” then we need to look long and hard at the actors we’re rejecting because their speech isn’t “ready,” is “too urban,” or who “aren’t articulate.” We need to look long and hard about how we teach our students. We need to look long and hard at the people we’re not hiring at all levels because we perceive their speech– or their presence– as performing a kind of Blackness (or Asianness, or any other kind of identity that differs from straight, white, cis, class privileged) with which white people are uncomfortable. I’m not excepting myself from this. Quite the opposite. I’m saying: This is a place wherein we’re falling down, and dragging far too many people down with us. Let’s examine what we’re doing more closely, and find a better way forward together. As a Black actor whom other Black people often told acted “too White” (yet I still get stopped by police and followed around stores when I’m buying my mother a birthday gift), I’ve seen from multiple angles how people get insecure about Blackness when it doesn’t conform to their preconceived notions. Spot on! I don’t know if you’ve seen this, but there’s been something of a shift around accent and class in the UK which exemplifies how beautiful it is when people speak the speech from their hearts, from their own culture. Since race and class are so often intersecting in the US, I think this very enjoyable clip – particularly as the teacher is Scottish and told he can’t teach Shakespeare, and the challenging student is South London and after being dismissed by the teacher, breaks into sonnet. Worth seeing till the end.